Wide Mouth Mason is a soul power duo comprised of Shaun Verreault (lead vocals/guitar) and Safwan Javed (vocals/drums). Wide Mouth Mason’s unique approach to jamming has earned them two invitations to the prestigious Montreux Jazz Festival in Switzerland (which resulted in the acclaimed 2009 DVD/CD release “Live! Montreux, Switzerland”) and tours with AC/DC, ZZ Top and The Rolling Stones. They became one of the first North American rock bands to tour China in the 21st century. Previous albums have yielded such hit singles as “Midnight Rain”, “My Old Self”, “Why”, “Smile” and “Change”. 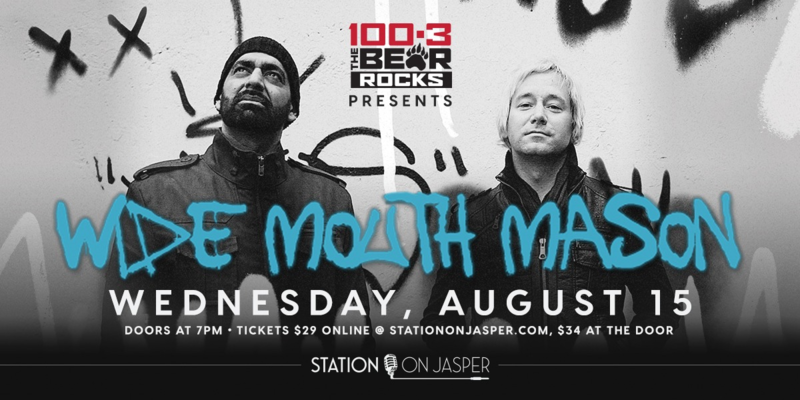 Station On Jasper presents an amazing night with Wide Mouth Mason. Doors for the show open at 7:00PM, but come in early for some great Happy Hour specials. This is a show you won't want to miss.